KOTA Longboards is a Veteran-owned and operated company based in Denver, Colorado that manufactures commercial longboards. They get their name from the ‘Knights of the Air’ moniker coined in France during the early days of WWI, used to describe the pilots of early airplanes. They started a Kickstarter campaign to fund their Spitfire Mk V Electric Longboards. The Spitfire Mk V is powered by a 35 volt battery, with a range of 15-17 miles on a single charge, and it’s capable of speeds of 22-25 MPH. 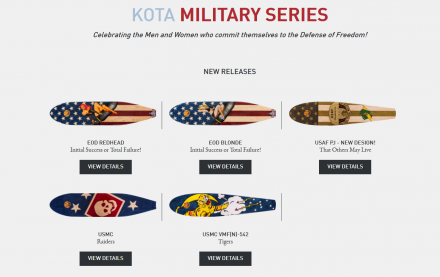 The best part is this setup can be paired with one of KOTA’s awesome Military-inspired decks, which is treated with KOTA’s proprietary KOTAgrip, a clear gloss finish which foregoes the need for grip tape while preserving the surface art. This entry was posted on Tuesday, March 20th, 2018 at 00:29	and is filed under crowdfunding, Vehicles. You can follow any responses to this entry through the RSS 2.0 feed. Both comments and pings are currently closed.